The Lebanon Mason Monroe (LM&M) Railroad offers nostalgic train rides on a vintage train departing year-round from downtown Lebanon, in southwestern Ohio. 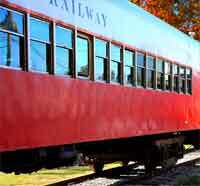 Passengers enjoy the only authentic, historic train with recreational rides, including tea parties, mystery trains, storybook character events and Christmas and Easter excursions. 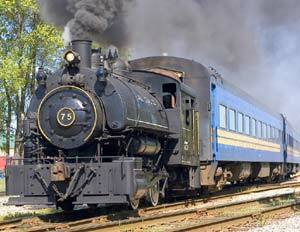 Conductors describe railroad history and operations and offer locomotive tours. Locomotive CNRY 55: one of the oldest GP7 locomotives still operating. The locomotive was ordered by the Pere Marquette (PM) Railroad from General Motors Electro Motive Division (EMD) in 1947, but was delivered to the Chesapeake and Ohio Railway (C&O) as a result of the takeover of the PM via a merger. The locomotive’s original number was 5705, and ran in general freight service all over the C&O, and subsequently the Chessie System, until it was retired, then purchased by the I&O around 1987. The 1500 horsepower locomotive was built in May of 1950 and was ballasted to 248,000 lbs., the heaviest GP-7’s on the C&O. The 55 is a dual service locomotive, capable of moving both passenger and freight cars, and was originally equipped with a steam generator to provide heat for passenger cars in cold weather. A conservative estimate is that the 55 has traveled well over 2.5 million miles to date. Above: Special appearance by the Flagg Coal Company's #75 that took part in the "All Steamed Up!" special event in June 2008. Coaches CNRY 101 - 104: Four open-window commuter coaches built in 1930 by the Pullman Company in Chicago, and by the Harlan & Hollingsworth division of Bethlehem Shipbuilding for the Delaware, Lackawanna and Western (DL&W) Railroad. These coaches did not require a locomotive because each car was self-propelled by four 3000 Volt DC, 230 horsepower electric motors receiving electricity from overhead catenary wires. Though each car was equipped with individual engineer’s controls, two or more cars could be coupled together as a train and operated by a single engineer in the lead car. The coaches operated in commuter service in the eastern New Jersey suburbs of New York City. for the (DL&W) Railroad until 1960, when the Lackawanna Railroad was merged with the Erie Railroad to form the Erie Lackawanna (EL) and continued to serve until 1976, and finally New Jersey Transit (NJT) until 1984, when they were purchased for use in Lebanon. At that time the cars were named after historic and significant places along the current LM&M line: Cars101 Mason, 102 Hageman and103 Turtle Creek each hold 72 passengers, and Car 104 Lebanon holds 54 passengers and features a snack bar. Open–Air Car CNRY 100: built by the Lehigh and New England Railroad (L&NE) in 1934 as a 40ton capacity freight gondola, the LM&M purchased it from the Maryland Midland Railroad (M&M) in 1986. This car has been extensively modified for excursion service, with new floor, elevated side rails and center rail, bench seating for 20 as well as pass-through doorways at each end. The car sports a headlight, bell, horn and control compartment and can be used in any order on the train consist because it provides “lead car and trail car” service. 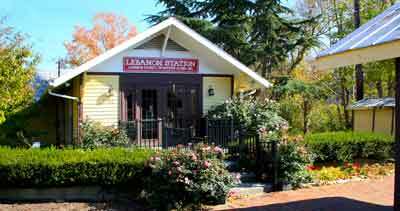 Built in 1972 as a replica of the original Lebanon Victorian-style passenger station and owned and maintained by the Lebanon Council of Garden Clubs. The land was purchased from the Penn Central Railroad and the Lebanon Council of Garden Clubs raised funds to build a membership facility on the property. The garden club members use the station as a library, meeting rooms, workshop space and memorabilia displays. 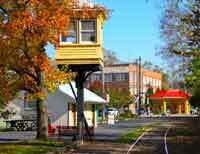 Throughout the season historic train offers recreational rides in Southwest Ohio, is formatting many of its excursion for fun and educational experiences for all ages thanks to the addition of several new programs. Many of the new rides are designed for people who want to learn more about train operation and history, and of course the special children excursions.